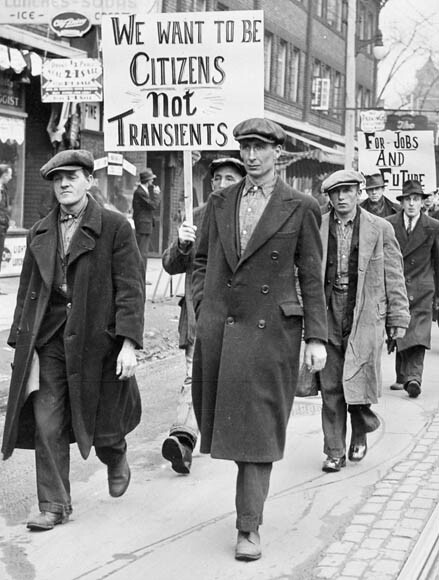 The Great Depression started way back in 1929 right after the time period called the Roaring 20’s which followed World War I. It hurt a lot of people’s feelings by what had happened. The stock market crashed. The stock market is a place where people give money to other businesses and in return make money if the business makes money. The stock market was a spark for the depression. Other causes include the depressed farms and industries, the growing gap between the poor and rich, the weakening of the bank industry, the problems in control of money, and the decline in foreign trade. People in the 1920’s spent a lot of money on cool stuff and toys. Most of the stuff was purchased on a credit card. People paid back what they owed in installments, or small amounts of money that would be made up over time. New machines in farming made crop production increase, and lowered the price for these goods. More goods were being made than sold, and then employees were laid off. Many of the industries declined too like the textile, lumber, mining, and railroad. People in the higher ranking of business like the bosses made lots of money. But that didn’t mean that the hard workers got paid as well. Many jobs were lost because of new efficient machines. Rich people wanted the cheapest labor possible. The crash caused the banks to lose money. When people went to the bank to go get their money, they couldn’t because it was all gone. So the people without jobs couldn’t pay their rent or house. The government believed that when the bosses got rich, the workers would get rich too. They decreased the amount of money the rich had to pay on taxes. After the crash, the U.S. government didn’t have enough money to keep America moving. The U.S. was very powerful in the world. The U.S. gave lots of money to other nations to help them. So when we ran out of money, they also ran out of money. This made the trade of goods internationally slow down and the high taxes of imports caused trade to stop. The time during the depression was hard on mostly everybody. 1% of the people had 59% of the money in the country. People had no jobs or unfair jobs where they didn’t get paid well. The country would recover from the depression, but not after years pain from high unemployment and harsh living conditions.